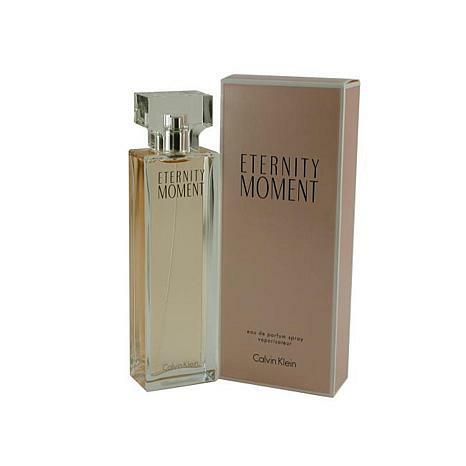 Launched by the design house of Calvin Klein in 2004, Eternity Moment Eau de Parfum Spray 3.4 oz is a womens fragrance that possesses a blend of Melon, Raspberry, Litchi, Chinese pink peony, Jasmine Eternity Moment is recommended for romantic use. This item may not ship to Alaska, Guam, Hawaii, Puerto Rico, or the Virgin Islands using a ground shipping method. Please select an air method when ordering this item for those locations. All Orders must also have a physical address and not a P.O. Box. Alcohol Denat., Fragrance (parfum), Water (aqua), Alpha-isomethyl Ionone, Benzyl Alcohol, Benzyl Benzoate, Benzyl Salicylate, Butyl Methoxydibenzoylmethane, Butylphenyl Methylpropional, Cinnamyl Alcohol, Citronellol, Ethylhexyl Methoxycinnamate, Ethylhexyl Salicylate, Eugenol, Farnesol, Geraniol, Hexyl Cinnamal, Hydroxycitronellal, Hydroxyisohexyl 3-cyclohexene Carboxaldehyde, Isoeugenol, Limonene, Linalool, Green 3 (ci 42053), Red 4 (ci 14700), Yellow 6 (ci 15985). I had used this particular CK scent a few years ago, then it disappeared from the stores. So I was delighted to find it on HSN! And I was able to get the economy size, which is a real bonus for me! I had to put some on as soon as I received it. Love, love, love it! Eternity Moment is one fragrance you can't really get the full beauty of until the drydown emerges. On first blast, I didn't like it, but after it had a just to settle in on my skin, it was an absolutely gorgeous fruity floral. Worth waiting for! Notes: Lychee, Guava, Pomegranate, Chinese Pink Peony, Passion Flower, Nymphea, Musks, Rose Wood, Raspberry Cashmere. I was hoping to like it but not for me. It's too strong. Flowery! I like sweet.